Rochester, NY is now home to one of the world's largest collections of Japanese videogames and will be available to the public. The National Museum of Play in Rochester, New York, has some of the rarest games, some still even in their wrapping. The Strong, a Rochester institution, which encompasses the National Museum of Play and the International Center for the History of Electronic Games, acquired over 7,000 games spanning 18 platforms, including the Famicom (NES), Sega Mega Drive (Genesis), and Nintendo 64. Last year a French game enthusiast known as Andre attempted to sell his collection on eBay for $1.2 million. However, the buyer never paid, leading the National Museum of Play to buy the collection. Wired states the museum did not disclose how much it paid for the collection, but it was significantly less than $1.2 million. Researchers can access the collection by contacting the museum and detailing what they would like to access and why. The games will also be preserved through video capture. The Strong is also compiling the games into a searchable database that anyone can use. 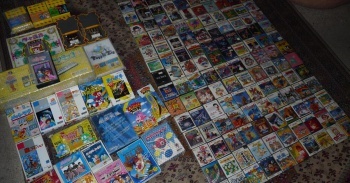 The collection has many rare games, some of which were not supposed to be sold but ended up being leaked, some promotional games, some games many people have never heard of, and others that were later published in the U.S. For example, the collection has a copy of Super Famicom title Seiken Densetsu 2, known in English as The Secret of Mana, and the collection is also home to the Famicom game Mother. More and more museums are researching, cataloguing, and featuring videogames in exhibitions. It's fascinating seeing how one person's collection can turn into another's research.